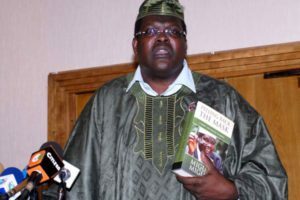 Miguna Miguna during the launch of his book titled Peeling Back the Mask at the Intercontinental Hotel, Nairobi last year. File photo. The Kenyan government has confirmed kicking lawyer Miguna Miguna out of the country days after he was arrested over the oathing of NASA leader Raila Odinga. Authorities used his Canadian citizenship to force him to fly to Canada just hours after the court ruled that police release him immediately. While the state claims that Miguna never reapplied for his Kenyan citizenship, questions have arisen on how he contested for elections without it. A government Twitter handle – @NexusKE – posted a tweet saying the Ministry of Interior had acted on the court orders to release Miguna. “Miguna is headed home. The court ordered he gets released and the Interior ministry obeyed the orders and even assisted him with a flight ticket home. Please note he renewed his Canadian Passport on June 16, 2017,” the tweet read. NexusKE describes itself as ‘The Official Government Newsroom – Communicating Transformation’ and is run from the Presidency. Interior ministry spokesman Mwenda Njoka also posted a tweet saying that Miguna had renounced his Kenyan citizenship but never re-applied after the promulgation of the 2010 Constitution. “Miguna denounced his Kenyan citizenship years back, acquired Canadian citizenship and never bothered to reclaim Kenyan citizenship in the legally prescribed manner neither did he disclose that he had another country’s citizenship despite being a lawyer who should have known better,” Njoka said. The 2010 Constitution allows for dual citizenship but the enabling legislation requires those who had ceased being citizens to re-apply to the Interior Cabinet Secretary. 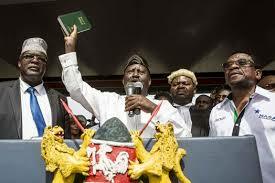 NASA leader Raila Odinga takes oath as People’s president of Kenya as Miguna Miguna (left) looks on. File photo. Before departure, Miguna said he will fight the grievous violation of his rights by the Jubilee government. “Instead of taking me to court as ordered repeatedly by the courts, they seized my passports and drove me to the runaway at the JKIA from 6pm up to now,” Miguna said in a text message moments before he left JKIA. Miguna’s troubles began when he stamped documents used for Nasa leader Raila Odinga’s self-inauguration as the people’s president at Uhuru Park in Nairobi on January 30. He was there with leaders including Ruaraka MP TJ Kajwang, who administered the oath, and Siaya senator and lawyer James Orengo, who has represented many of the coalition’s politicians in legal matters.